This covers the building of the upper fuselage longerons. These are built using jigs to get the curved shape. 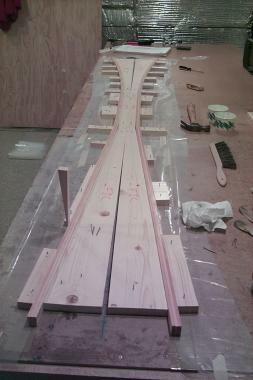 Each longeron is made of three strips of spruce epoxied face to face. Doublers are floxed into position on the longerons. November 19, 1999. Here are the four FJA jigs. I made these back before my epoxy pump showed up. November 20, 1999. 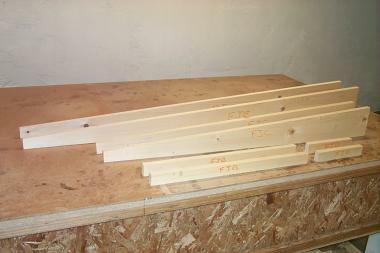 Jigs FJB, FJC, FJD, and FJE. January 31, 2000. 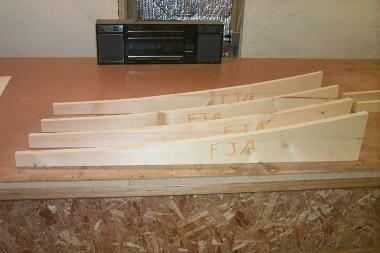 Jigs FJA, FJB, and FJC in place ready to form the longerons. 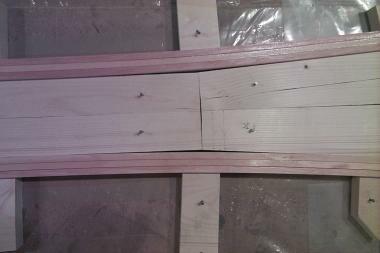 I highly recommend laying down 4mil plastic or the box tape before nailing the jigs in place. It's harder to do afterward as in the plans. January 31, 2000. 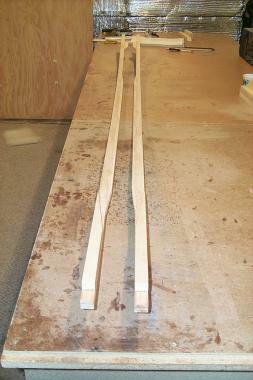 Here are the two longerons securely held in place against the jigs. 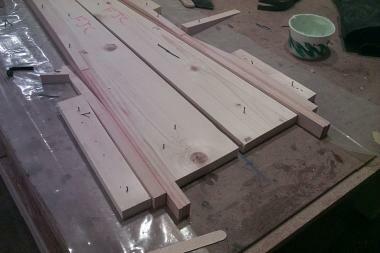 I don't have any clamps (I wish I did) so I just nailed lots of little blocks against the longerons. The biggest Issue I had was with epoxy on the face of the longerons. I have little doubt that the longerons are sticking to the jigs and the blocks. Shouldn't be much though. Next time I would put box tape on the face of the jigs as well as the table. January 31, 2000. Here is a close-up showing the transition from FJB to FJC. There is a definite gap. There needs to be, the transition it too sharp for the longeron to conform. November 20, 1999. Here are the doublers. These were made a while back too. February 1, 2000. 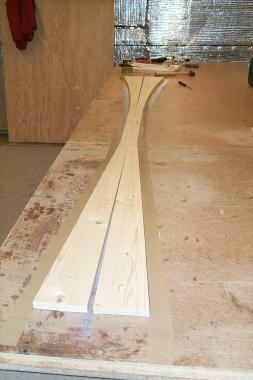 Here is the 60" doubler curving from FJA to FJB. 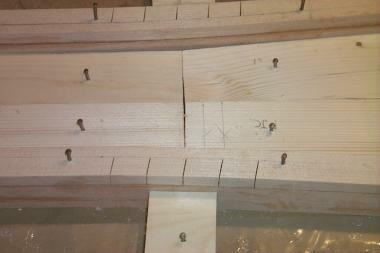 Lots of nails in predrilled holes are holding the doubler in place. I spread flox on the longeron, placed one end of the doubler in place, and drilled holes and applied nails from one end to the other. February 1, 2000. 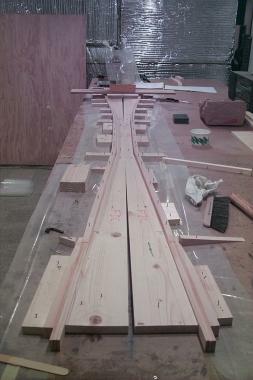 Here is a close-up of the 60" doubler as it curves from FJB to FJC. You can see the saw cuts that allow the doubler to bend. I made these with the band saw. Nice thin cuts that worked great. 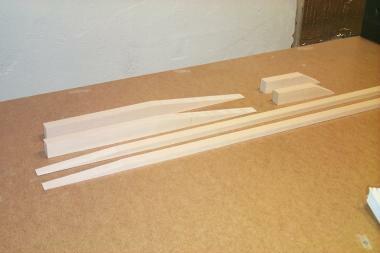 Five cuts were made at each of the two bends, 0.45" deep at 0.75" interval per plans. February 1, 2000. 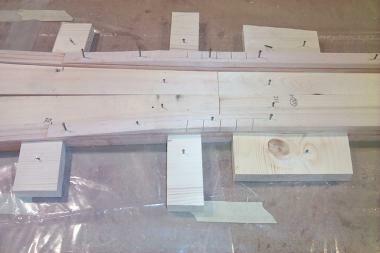 Here are the aft doublers in place on the sides of the longerons. Nothing fancy here. February 1, 2000. Here are the two forward doublers being weighted down. February 1, 2000. 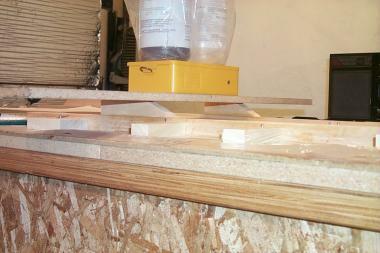 The completed longerons and the doubler all held in place on the jigs while they dry. February 2, 2000. The completed longerons and the doublers.